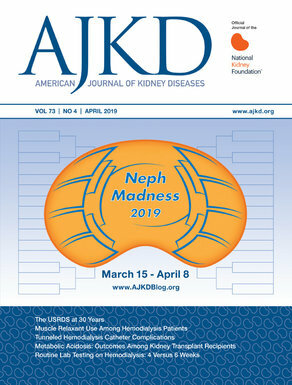 Ricardo et al recently published a prospective cohort study in AJKD using NHANES data from 1988-1994 on the association between mortality and retinopathy in CKD patients. We know that retinal vascular changes (ranging from arteriolar narrowing to microaneurysms and hemorrhages) predict all-cause and cardiovascular mortality in diabetic and/or hypertensive patients. We have also used diabetic retinopathy as a “virtual biopsy” (erroneously sometimes!) to diagnose the etiology of kidney disease in diabetics. In general CKD, does retinopathy exist? Is it an indicator of poor prognosis? Could useful information be gained from a fundoscopic exam to risk stratify CKD patients? Dr. Ana Ricardo (AR) discusses this very important topic with eAJKD contributor Dr. Veeraish Chauhan (eAJKD). eAJKD: Your study looked at the association between mortality and retinopathy. Why do think this is important, and why did you pick this specific topic? AR: We believe that the association between retinopathy and mortality is important because the evaluation of the retina is a non-invasive procedure relatively accessible to most individuals. Therefore, if retinopathy is shown to be a significant predictor of mortality, we can move on to study whether screening for retinopathy improves patient outcomes. eAJKD: We have traditionally used retinopathy as a surrogate marker for diabetic kidney disease in patients with long-standing diabetes. Did you find the association between retinopathy and mortality to be as strong in the non-diabetic population as in the diabetic population? AR: In individuals without kidney disease, we found that retinopathy alone was not statistically associated with mortality among participants with or without diabetes. However, in the presence of chronic kidney disease, retinopathy was a strong predictor of mortality in individuals with or without diabetes, with a similar magnitude. For example, compared with participants who had neither retinopathy nor chronic kidney disease, the presence of both of these conditions was associated with a 2-fold risk of mortality among individuals without diabetes; among diabetics that risk was 2.5-fold. eAJKD: Your study did not report a significant association between retinopathy and mortality in individuals without CKD. How do you explain this? AR: It is possible that because of the low prevalence of retinopathy among participants without CKD in our study, there was not enough power to detect an association between retinopathy and mortality. Additionally, photography of only one eye may have contributed to underestimation of the prevalence of retinopathy in the non-CKD population. eAJKD: What possible mechanisms might explain this association between retinopathy and mortality in non-diabetic CKD patients? AR: The exact mechanisms underlying the association between retinopathy and mortality, in particular among individuals with chronic kidney disease, are not known. Possible explanations could include damage to the microvasculture due to aging, hypertension, atherosclerosis, and other vascular and endothelial changes that might be present in the retina as well as other vascular beds, such as the heart, brain, and kidneys. eAJKD: We use prognostic markers in clinical practice to predict outcomes in a chronic kidney disease patient. Some of these markers include proteinuria, blood pressure control, and glycemic control. Would you recommend adding regular fundoscopic exams to look for the presence and severity of retinopathy to this list? In other words, should all non-diabetic chronic kidney disease patients undergo regular fundoscopic exams? AR: Our study provides only preliminary evidence of retinopathy as an important predictor of mortality in individuals with chronic kidney disease. We believe that future work is needed to determine whether fundoscopic screening in chronic kidney disease patients should be used as an assessment tool for cardiovascular risk in this population.